I was entering some random cards from my collection into the checklist database tonight and came across this card. 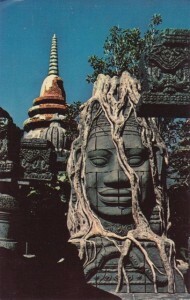 It is of an overgrown temple in the jungle cruise at WDW. This card illustrates why I love Disney parks. The attention to detail is superb…and you can really tell that they do a lot of research for their attractions. This is evident today in Cars Land with it’s homage to the “Motor Age” and Route 66, and it was true back in the late 60’s when this scene at right was developed at Walt Disney World. 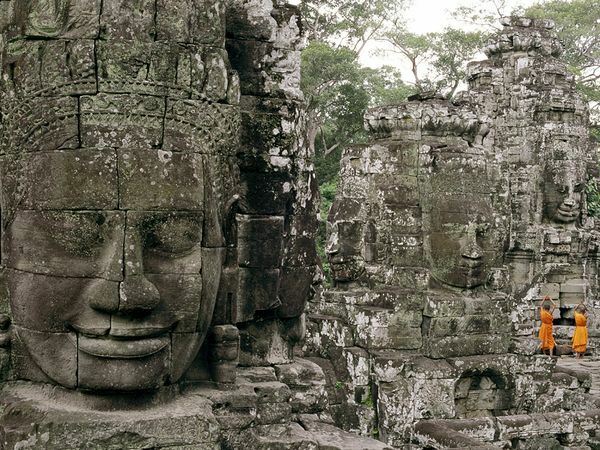 In 1994 I had the opportunity to visit Cambodia as a tourist. This Jungle Cruise card brings memories of that trip back to me immediately. 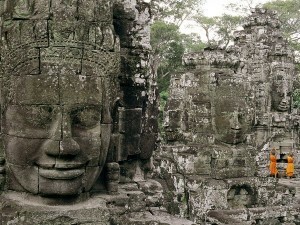 The face is an instant reminder of the complex of Angkor Thom (shown below) very near Angkor Wat in northern Cambodia. The similarity is, well, rather obvious. The WDW card above is #0033 from the Roger LeRoque and Nick Farago guide. Card number 01110206 (79913-C). This entry was posted in Disney World, Disney World Postcards. Bookmark the permalink.